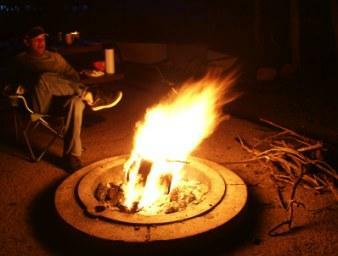 Fire pits are very popular, but you also need to keep fire pit safety in mind when using one. The tips listed in this article will help you get the most out of this enjoyable outdoor accessory and reduce the likelihood of injury and damage to property. Installing a fire pit in your back yard can give you hours of enjoyment with friends and family. Sitting around an open fire reminds us of time spent in similar activities as children. The fire has a hypnotic effect on the observer, and the fragrance of the burning wood is quite pleasant. It's a wonderful way to pass the time and relax. The first thing you will want to do before buying a fire pit is to find out about the regulations that are in place in your city, town, or county. Some municipalities have banned their use outright, while others have restrictions on the type allowed. Failure to obey the law may result in your being charged under local laws and having to pay a fine. Fire pits are for outdoor use only. If you think you are going to buy a fire pit and use it as a sort of interior fireplace, you need to reconsider. These products are designed to be used out of doors only. A fire produces carbon monoxide, which can cause serious health consequences or even be fatal in higher doses. Place the fire pit away from structures and trees. Consider the location for your fire pit carefully. You want to make sure that you don't place it too close to your home, garage or shed. Trees can represent a hazard when the fire pit is placed too close to overhanging branches. A spark can land on dry branches and/or leaves and ignite. Install a screen around the fire pit. The screen will help to keep sparks from getting away from the fire pit area and igniting items around it. Keep a fire extinguisher close by when using the fire pit. It's also a good idea to keep a working fire extinguisher close by when using the fire pit. That way, you can deal with any small fires quickly. Be sure that you know how to use it before you need to do so in an emergency. Use only recommended fire starters. Check the manufacturer's instructions or user manual to find out which brands they recommend. Gasoline should never be used to start a fire in a fire pit. Check the weather before using the fire pit. Using a fire pit in windy conditions is not safe. The wind can pick up and spread sparks around. Keep a close eye on children when the fire pit is in use. Children should be taught never to play near a fire pit. The idea that they should be respectful of fire should be taught from an early age. Never leave the fire pit unattended while in use. If you need to leave the fire pit area for any reason, make sure that a responsible adult is available to keep an eye on the fire until you return. Make sure that the fire is completely extinguished before you go inside for the night. You can either use a fire extinguisher for this purpose or pour water on the fire pit to put it out. Once the fire is out, cover the fire pit with a lid to keep the area secure. If you are going to remove the coals or the wood from the fire pit area, place these items in a metal bucket, as opposed to a paper bag. There is still a chance that they will be "hot" and could start a fire if they come into contact with a flammable item. Keeping these fire pit safety tips in mind will help to reduce the risk of injury while you enjoy the Great Outdoors in your back yard.